Day 20 of the 30-day challenge. Henrietta and Rupert were together through all six of her marriages. The second and fifth, Sydney and Lars, died quite unexpectedly. Vicious rumors accuse Rupert of having been the cause of at least one of those accidents (as well as two of four divorces). He was still robust at twenty-four years old, which was the last time anyone saw Henrietta or Rupert alive. Submitted for the topic “Beginning” at Illustration Friday. Six marriages, two funerals, and four divorces is a lot of beginning over. Even if your loyal cat sees you through it all. Henrietta is maiden number 145. Hooray, it’s an 8×10! The background could use additional layers but at one painting a day and work tomorrow, it’s going to have to stop here. Don’t be surprised if many of the next ten days involve tiny portraits, apparently my new favorite thing. 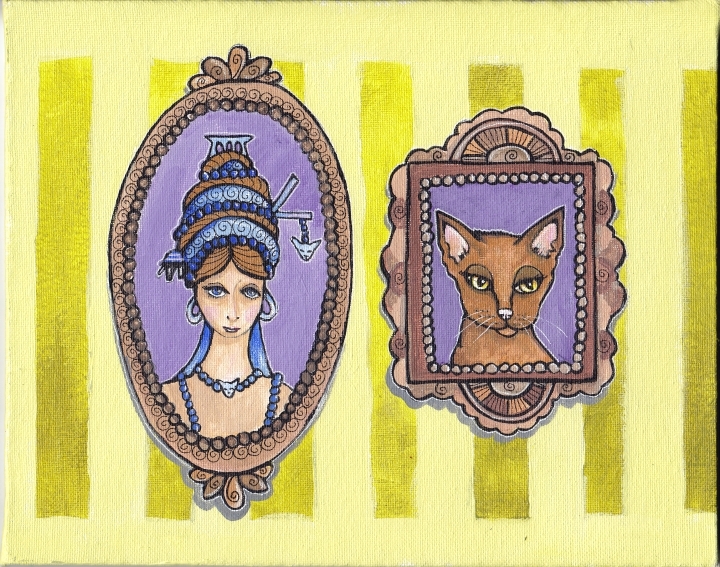 This entry was posted in Acrylics, Elaborate Costume, Progression Photos, Stories and tagged cat art, Illustration Friday, maidens on January 19, 2014 by The Beast Tender. well done. Love the story too. Lovely pictures. And the story is great. Have a lovely week!!! Yay I love it! I love everything about it. MORE TINY PORTRAITS!! Ha ha ha! Love the painting AND the backstory! oh you’re fun. I’m putting you in my blog reader RIGHT NOW! ps thanks for visiting my blog as well. Cindy, great story. I like your Henry the Eighth inspired story. I also like the images you have of the steps of your illustration process. Yes, I am with David! I am happy that it’s a WOMAN this time around doing all of the marrying! And look at poor Rupert. Would he seriously hurt anyone?! I think not. Rupert must be vindiated! And this canvas must be celebrated!